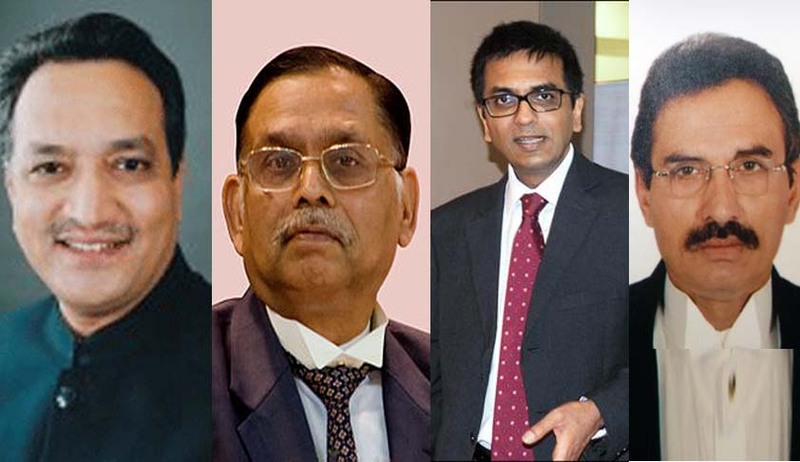 Justice Ajay Manik Rao Khanwilkar, Justice Dhananjaya Y. Chandrachud, Justice Ashok Bhushan, and Nageswara Rao are sworn in Today as Judges of Supreme Court of India. Chief Justice of India has administered the oath of office to four new judges at the Chief Justice’s Court Hall. The function was attended by Supreme Court Judges, law officers, Lawyers and family members of the new judges. With the appointment of new Judges the total strength of the Supreme Court is 29 now against the total strength of 31. Justice Dhananjay Chandrachud and Ajay Manik Rao Khanwilkar is from Maharashtra Justice Ashok Bhushan is from Uttar Pradesh and Justice Nageswara Rao is from Andhra Pradesh. Justices S.M. Sikri, S.C. Roy, Kuldip Singh, Santosh Hegde, Rohinton F. Nariman, U.U. Lalit were the other Judges directly appointed from the Bar. Justice Dhananjaya Y. Chandrachud was the Chief Justice of Allahabad High Court. He did his Masters in Law from Harvard University. He was appointed as Additional Judge of High Court of Bombay on Mar 29, 2000. He has been Chief Justice of Allahabad High Court since Oct 31, 2013. Justice Ashok Bhushan was the Chief Justice of High Court of Kerala. He was elevated as permanent Judge of the Allahabad High court on 24th April, 2001.He was Judge of the High Court of Kerala on 10-07-2014, and took charge as Acting Chief Justice later confirmed as Chief Justice. Nageswara Rao was a Senior Advocate and former Additional Solicitor General of India. He has been appearing in very prominent cases and enjoys a good reputation among the members of the Bar. He was also a member of the Supreme Court-appointed Mudgal Committee headed by Justice Mukul Mudgal, tasked with conducting an independent inquiry into allegations of corruption, betting and spot-fixing in Indian Premier League matches.